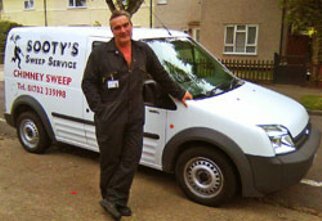 Sooty's Sweep Service was founded in 1991 by myself Andrew Payne. I am a fully qualified Hetas approved chimney sweep and long serving member of the National Association of Chimney Sweeps. My objective is to keep you safe, warm and cosy by helping to prevent chimney fires or dangerous fumes from entering your home. It is important your chimney is swept regularly with a brush and vacuum system. I recommend at least once a year if you use your chimney. I offer my service to the domestic and commercial market in Southend-on-Sea and the surrounding areas of South East Essex. For a clean, prompt and friendly service contact Andrew or Sooty!! I was honoured to be guided initially by Arthur Duncker of Cyclone Suction Company, a chimney sweeping business dating back to the 1950's. Arthur gave me a sense of tradition and loyalty to all customers.